Apports or teleported objects are materialized objects that have been transferred from one location to another usually by spirit. In a seance or what is called physical mediumship, that is where everyone can hear, see and feel spirit, objects can come out of the mediums mouth, eyes, hand or the celling (“thin air”) . These objects can be crystals, jewellery, or anything really! 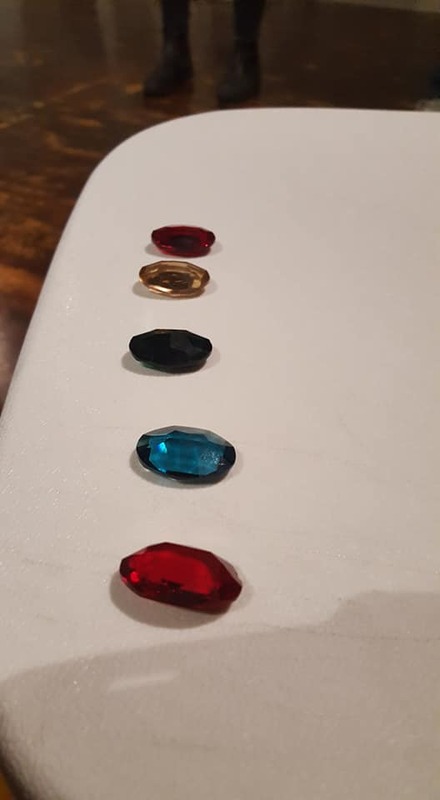 Here are some crystals that came through in a seance in October of last year. They came though the mediums mouth! When they come out they are dry and they all came out one after another which is crazy! I got one of the red ones. I have seen them come out of the mediums eyes and giant crystals come out of his mouth. The objects that come through hold a lot of energy and serve a purpose for who it is given to. A few years ago I was sitting in my bedroom and could feel spirit there so I mediated for a few moments but I couldn’t get anything. I went out into the living room and on my bag there was a bandanna that was folded neatly on top. I had walked by that bag many times that day and it was not there before. I asked my boyfriend if it was his he said no and got all freaked out and tried to throw it out! It turned out that the bandanna was for me to help me with my songwriting. So next time you find a dime, feather or apport of any kind, hold onto the item and tune into its energy and see who it is from and what it is for. They can be very helpful and if nothing else, it’s super cool!